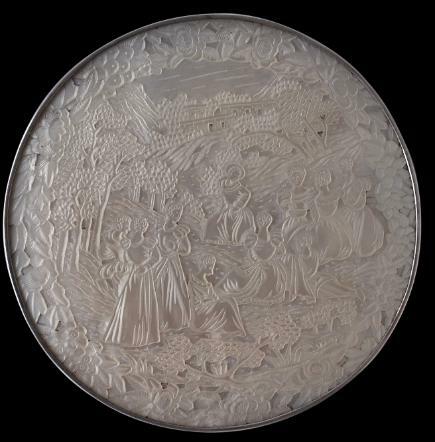 Almost certainly made for the Western European market, this silver-mounted snuff box comprises two large, round discs of carved mother-of-pearl shell and various carved mother-of-pearl plaques that comprise the sides. The box is composed of two equal halves that fit together. The interior is lined with silver. It is of unusually large size, and the carving is of exceptional quality – indeed, it is one of the finest examples that we have encountered. Typically, early nineteenth century Chinese export mother-of-pearl snuff boxes are carved with Chinese motifs or scenes, but more unusually, this is carved on both sides with scenes of European interest. A group of European ladies in early nineteenth century dress and in an outdoor setting, all within a floral border, is to be seen on one side. And on the other is a depiction of Napoleon’s tomb, on the South Atlantic island of Saint Helena, also within a floral border. The depiction almost certainly is a copy of an engraving not unlike the example below. The sides are carved with various smaller plaques, all Chinese in character, including Chinese village scenes, a pair of ducks, and a pair of fish. In 1815 the British government selected Saint Helena as the place of detention of Emperor of France Napoleon Bonaparte. He was brought to the island in October 1815 where he stayed until his death on 5 May 1821. Saint Helena remained in the East India Company’s possession during this period, although the British government contributed to the costs of guarding Napoleon. On his death, Napoleon’s body was interred in a grave in a valley on Saint Helena, a valley that came to be known as the Valley of the Tomb. 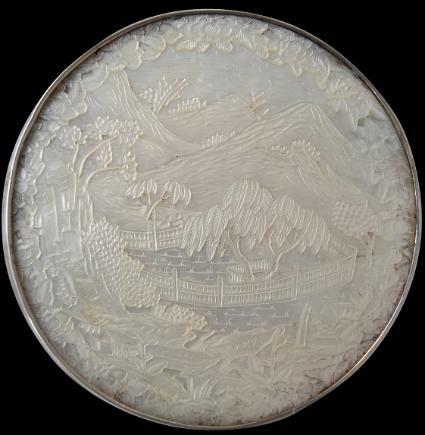 It is this valley that clearly is depicted on this snuff box. In 1840, the body was re-interred in Paris in the Hôtel des Invalides. 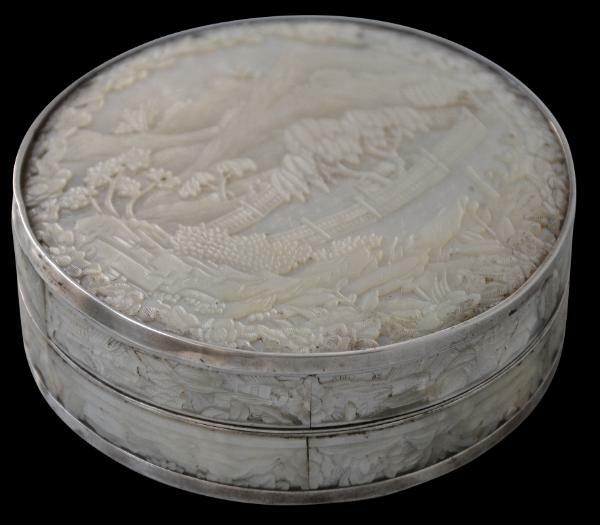 This snuff box is important for its size, quality, and its cross-cultural interest with its important European historical themes but using Chinese crafts and materials. 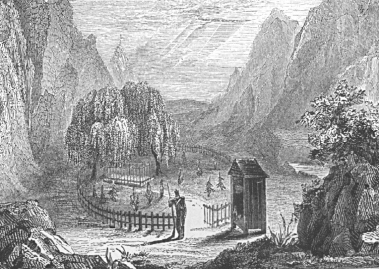 The last image shows an early engraving of of Napoleon’s tomb on St Helena. Dozens of items are added to our website each month. Be among the first to know about them.